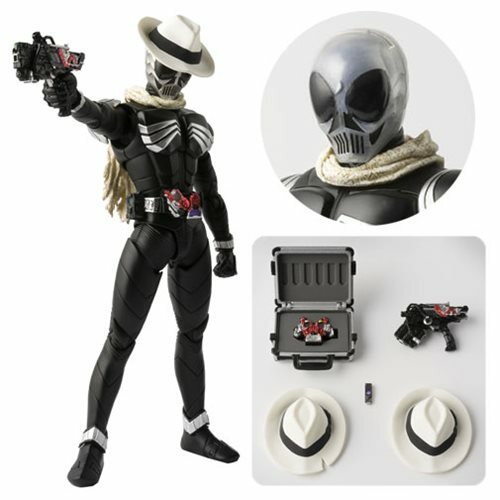 The Kamen Rider Skull SH Figuarts Action Figure joins the SJ Figuarts line up. Made using cutting-edge action figure technology the Kamen Rider Skull SH Figuarts Action Figure is designed from the bone structure out for a striking and naturally dynamic range of posability. The figure includes 5 pairs of optional hands (L/R), an optional head, an optional scarf, 2 hats, a Skull Magnum, a Gaia Memory, and an attached case. Measures about 5 7/10-inches tall. Ages 15 and up.